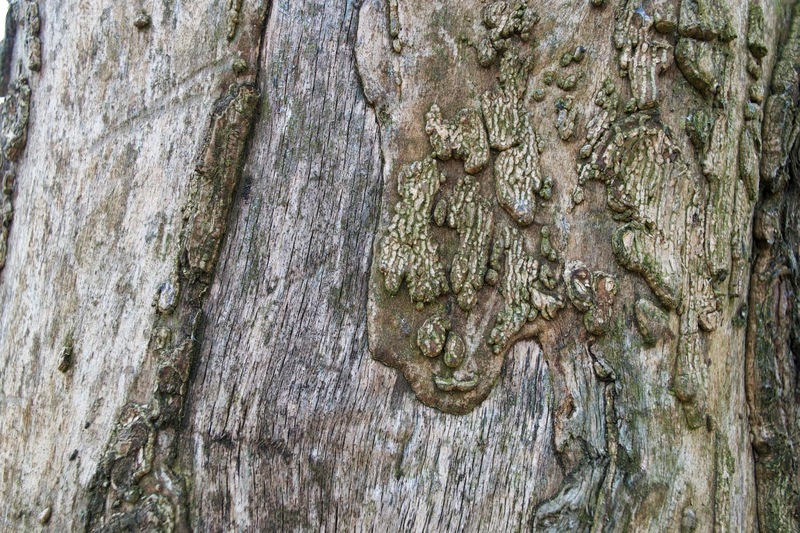 The bark of a tree has some wonderful textures to it: smooth, scaled, cracked, ridged, or some combination of these. There are generally two layers of bark, the outer layer and inner layer. Inside of these are the notable rings of wood that increase in number each season as the trunk grows to expand its girth. It is this growth that tends to cause the outer layer of bark to crack and peel away, giving it some of its distinct textures. Interestingly, it is not uncommon for the inner layer of bark to have the ability to photosynthesise, and if you scratch at the surface of a twig with your nail, you may expose a surface with a greenish tinge, indicative of the presence of chlorophyll, a requisite for photosynthesis. In this very close-up photo of tree bark, you can see the top layer of outer bark peeling away to expose the inner bark. You can also see a greenish tinge, though whether this is the chlorophyll in the tree or perhaps some common tree lichen, I am not quite sure!